Leaders of the G7 group of nations are meeting in Brussels for a second day of talks, with the global economy, climate change and energy on the agenda. David Cameron is among the leaders at the summit, along with US President Barack Obama, Germany's Angela Merkel and France's Francois Hollande. The Prime Minister will later travel on to Paris where he is set for face-to-face talks with Russian President Vladimir Putin, who has been excluded from the G7 summit because of his country's annexation of Crimea from Ukraine. David Cameron will deliver a direct warning to Vladimir Putin today to end Russia's "unacceptable interference" in Ukraine or face growing international isolation. The Prime Minister will hold face-to-face talks with the Russian leader in Paris ahead of tomorrow's 70th D-Day anniversary commemorations amid deepening anger over Moscow's treatment of its neighbour. On the eve of a hastily-arranged summit of the G7 summit in Brussels, the leaders of the G7 group of industrialised nations warned last night that they stood ready to impose damaging economic sanctions on Russia on top of the asset freezes and travel bans already in place. "We are united in condemning the Russian Federation's continuing violation of the sovereignty and territorial integrity of Ukraine," they said in a joint communique. David Cameron has issued a fresh warning to Russia over Ukraine ahead of meeting president Putin tomorrow. Speaking from Brussels at the first G7 summit without Russia for 17 years, Mr Cameron said: "The G7 should send a clear message of support to Ukraine and a united message to President Putin that he needs to engage with the Ukrainian government to find a diplomatic solution to the crisis. "That's what I'll be saying to President Putin myself tomorrow. This is the first summit without Russia since the 1990s. And until they change course, they need to understand that they will face continuing isolation and no seat at the table." The G7 leaders effectively expelled Russia from the annual gathering, which Mr Putin had been due to to host in Sochi, following its incursion into Crimea. 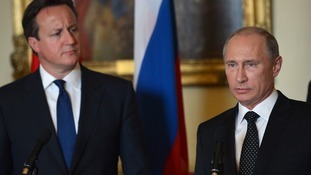 Cameron and Putin are due to meet tomorrow in Paris ahead of the D-Day 70th anniversary commemorations on Friday. Although European leaders and US President Barack Obama have said they stand ready to impose tougher sanctions on Moscow, a fresh wave of penalties is not expected to be announced. Premiers from the world's leading economic powers will renew pressure on Russia to act over the crisis in Ukraine at a summit in Brussels. Leaders of the G7 group of economic powers will also try to thrash out the outline of an agreement over tackling the threat from terror posed by the Syrian conflict.